So, remember back in December when we told you about how we like to embrace change and new opportunities? We’re doubling down on that point. The plans to move from the current HQ to a sweet shop just down the street have been dashed, pleasantly so, because when opportunity knocks, one must be savvy enough to answer. So, when a lovely buyer wanting to open a fresh store in Roanoke came calling, owner Melani Wilson answered with an emphatic yes! While The Trove may cease to exist currently in a physical form, the store is most definitely not going away. Immediate plans include bulking up the website, offering brands and products you’ve come to know and love, as well as fresh pieces that will become new faves. So when you need a jolt of The Trove, you can always visit us at www.thetrovestore.com. In addition to that, other thoughts are percolating, but the outcome remains to be seen. But let’s get down to brass tacks. This new twist means we have more inventory to sell - and at the massive discount of 60% off that’s been a smashing success already. We’re adding even more to our sale, including some fixtures and furniture not previously included. Oh, and did we mention Barefoot Dreams? And some other, not to be missed additions? If you missed out on the sale these last couple of weekends, don’t worry because we’re adding more dates. And if you’ve already shopped the moving sale, you’ll want to come back. We want to say a BIG thank you to everyone who’s ever shopped at The Trove in Roanoke. We’ve had an absolute blast and we can’t wait to begin our new adventure online, and perhaps beyond! Yes, we're relocating just a hop and a skip down Main Street, but that doesn't make packing and moving boxes any more pleasant. So, it's S A L E time! Help us lighten our load while snagging fab merch with amazing discounts. Starting Tuesday, January 8th, until Saturday, January 19th, everything in the store will be 40% off, with a few exclusions such as Ambre Blends and Barefoot Dreams. We'll be open our normal hours during this time. Our final Don't Make Us Move It Sale will be on January 25th & 26th, as well as February 1st & 2nd, with inventory marked up to 75% off! The Trove will be closed during those two weeks, except for these Friday/Saturday sale days. We'll close our current location at the end of the day on Saturday, February 2nd. Our Grand Reopening date at our new digs has not yet been set, but rest assured we'll shout that information from the rooftops once it is. so swing into #thenoke and shop your heart out! Heraclitus said, “Change is the only constant in life”, and he’s right, of course, as those ancient philosophers always seem to be. Some people fear change, while others fully embrace it. We’re more the latter, and so it is with this spirit we announce our latest news: We’re moving! It’s been a glorious 5 years in #thenoke, and we can’t wait for the freshness of a new year and a new start. In early February 2019, we’ll be moving from our current location, just a hop and a skip down the street to 112 Main Street. We will always have a soft and fuzzy spot in our hearts for our current HQ, especially that swoon-worthy barn, but we can’t wait to pass it along to its next owners, to live its next life. Change is good. Change helps keep us on our toes. The new space at 112 Main Street will offer us the opportunity to switch things up, make some changes, breathe new life into our work. As Roanoke continues to grow and evolve, so do we - and we’re pretty jazzed about it. What this means is that we’ll have a little cleaning out to do, which also means we’ll be having S A L E! Yippee! Shop our holiday blow out sale starting December 27th, and after that, we’ll have a few other tricks up our sleeves. So stay tuned, and come see us before we move. And then again after we move. Just come see us, will ya? Cheers to change and the excitement of a new year! Sisters... many shared traits and charms but each with their own personality. The same is true of The Trove and our sister store, The FIND. While we do share some of the same brands and products, we also take great care in curating a unique selection of goods for each store. If you haven't shopped The FIND recently, now's the time to swing in to #DTFW, which is beautifully decorated and sparkling for the season. Bring your receipt from The Trove to The FIND to receive 30% off one item (excluding Barefoot Dreams and Ambre). Did we mention this works the other way around, too? What we're saying is, come shop both sisters! It’s been a dizzying five years (FIVE???) since we flung open the doors of The Trove and its lovely backyard barn. We forever adore Roanoke for many reasons, but particularly because it’s been such a wonderful place to express our creativity and commune with our neighbors and fellow business owners, all in a delightful, small town setting. Roanoke may be small but it’s big on charm, growing and deepening with every business that decides to set up shop along and around Main Street. We couldn’t be happier to have spent these last five years as a small part of its magic, and we’re beyond thrilled with what the future holds… but that’s a story for a (near) future post, friends. In the meantime, we’re looking back at some of our adventures and realizing just how far we’ve come. Stroll down memory lane with us, will ya? We knew these beautiful buildings had good bones, and that they only needed a little freshening up. Okay, maybe a lot of freshening up, but the work was well worth it. 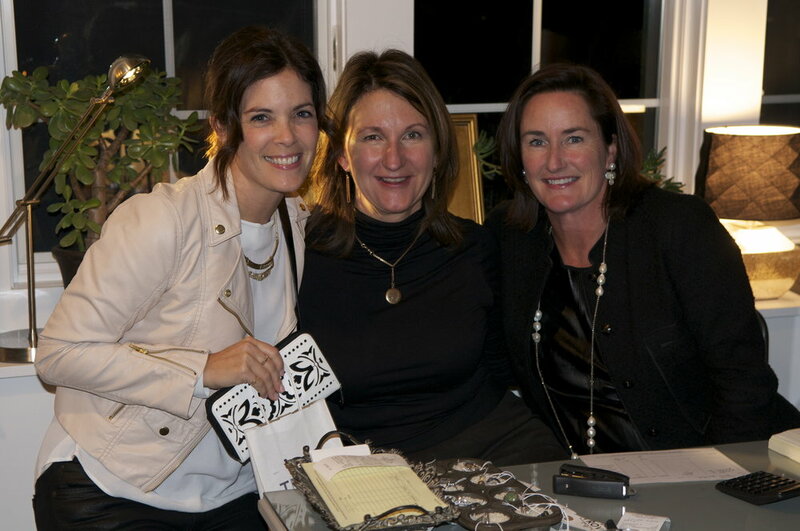 We’ve hosted so many sales, pop ups and parties both in our barn and on the lawn. A fresh coat of paint can really make a big difference, huh? Once LML Estate Management put their stamp on the grounds with the most gorgeous landscaping, our little compound felt like home. Putting on the finishing touches, and remembering how fun it was to take a raw space and fill it with all our favorite things. Our first purchase was made by the lovely Sherry Holifield. | Most of the OG crew at the Atlanta buying markets one season. When shopping + drinking wine is quite literally your job, it’s easy to feel hashtag blessed. But don’t get us wrong, owning and running a retail shop is not for the faint of heart! Naturally, there are so many stories to share and future plans to dream up. Swing by #thenoke and say Happy 5th Birthday to The Trove! Cheers to the next five! Fall is here and it’s one of the most dazzling seasons for our corner of Indiana. The leaves are gorgeous, the air crisp and the charming town of Roanoke is buzzing with all manner of fun. We celebrate the season with town gatherings and festivals, hosting pop up shops in the barn with our artistic and crafty friends and decorating for the festive holidays to come! We’re always updating our assortment of clothing, home decor, jewelry and gifts, always with an eye for the unique and special, as with a strong emphasis on small and local makers and brands. 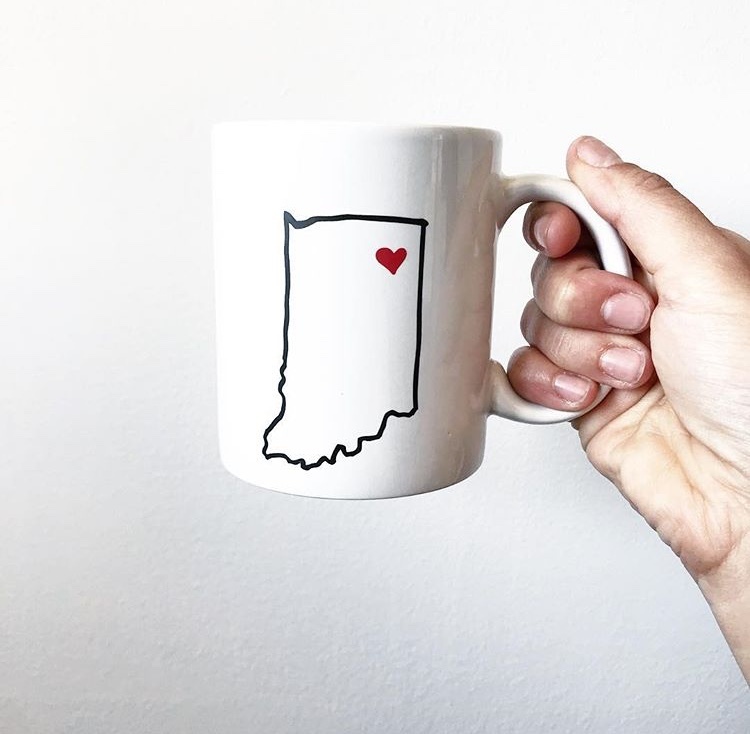 Swing in to #thenoke and you’ll discover a wonderful collection of restaurants and shops that bring so much zest and style to Northeast Indiana, so don’t be a stranger! 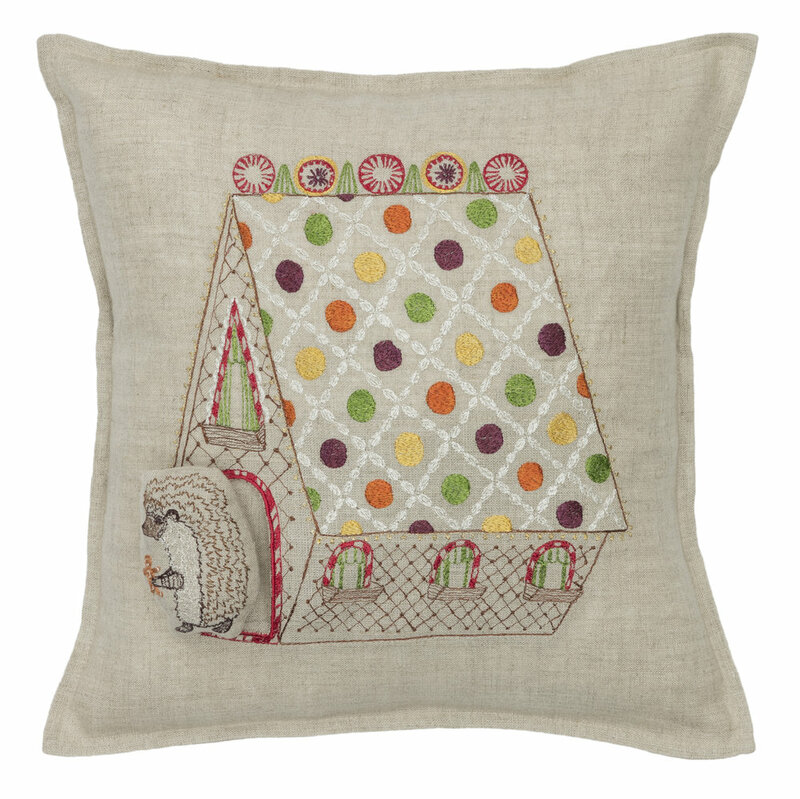 We’re longtime fans of Coral & Tusk, a line of textiles featuring hand-drawn illustrations and delicate embroidery. Designer Stephanie Housley has created heirloom quality pillows, stuffed animals, tableware and gifts, featuring delicate metallic threads, whimsical characters and a dreamy color palette. The new designs for Fall/Winter will bring beauty, warmth and texture to your home, and the holiday collection of table textiles and decor accents make for tasteful, chic gifts. Come shop the latest and greatest from one of our most beloved brands! We're stocked with the most charming, funny and/or stylish drinking vessels for every taste and...taste. We believe morning coffee is better out of a cheeky mug, and an evening cocktail better out of a gorgeous highball. We also love gifting wine, beer, fine mixers or freshly pressed juices with the appropriate glassware for birthdays, when visiting friends or as part of a gift exchange during the holidays. Our mugs perfectly pair with locally roasted beans and a package (or three) of Wild Ophelia Cold Brew chocolates, or high quality herbal teas and a tea towel. Shop our picks for an added dose of style for the tabletop. Shop our Bar and Home Goods sections online or come into the store for our full collection of drinking vessels! We love our barn so much, we like to brag about it from time to tome. And let's face it, she's a charmer! While we spend a lot of time focused on the main store, we decided it was high time we spent some QT inside the barn, so we've been hard at work in our slice of #thenoke, With fresh eyes, updated goods as well as updated plans for more interactive events, we're quite happy with the results, and we're confident you will be too. Our rearranging and refreshing has made the space more functional for shopping as well as workshopping. We'll have a few more hands-on events and classes rounding out the summer and early autumn, and we can't wait to host our crafty guests in our updated digs. The barn is home to a fresh supply of indoor and outdoor garden accents, candles and gorgeous vessels. Sometimes the smallest details end up making the biggest impact. From floral prints on clothing, water bottles, art prints and calendars to the real thing in beautiful vases, on wall hangings, and infused into skincare products, we're plant lady crazy. Calling all Plant Ladies, come shop in #thenoke! * If you're searching for some beautiful little plants, shop our friends at Fancy & Staple in #DTFW for air plants, succulents and more!